The Harrowing Holiday Harpoon Harp is a Limited Edition Draconic type weapon. 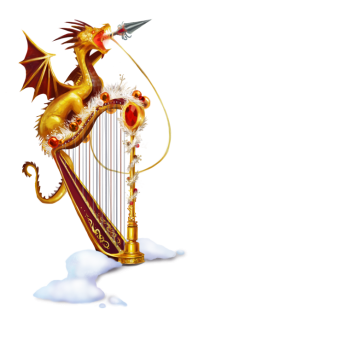 An enchanting melody plays on this fantastical harp, a tune so old that only Draconic mice would know of its origins. Once an intrigued mouse comes near, it triggers the continuation of the tune, luring the mouse even closer. During the crescendo, the inconspicuous dragon ornament takes aim at the enthralled concertgoer, then it fires its harpoon at the climax of the song, while the mouse is in a deep trance. The Harrowing Holiday Harpoon Harp is a Limited Edition weapon. It was available for sale in the Great Winter Hunt 2017 Trapsmith for 150,000 gold and 1 Nugget of Nougat. The Harrowing Holiday Harpoon Harp acquires a 20% Power Bonus when armed with Snowball Charms. 12 December 2017: The Harrowing Holiday Harpoon Harp was released as part of the Great Winter Hunt 2017 event. This page was last edited on 27 January 2019, at 01:38.